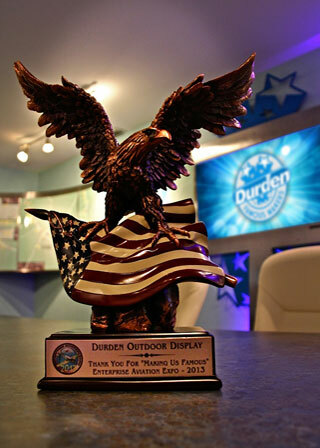 Durden Outdoor received this beauty over the weekend. We were recognized by the 2013 Enterprise Aviation Expo. The 5th Annual Enterprise Aviation Expo highlighted war-birds from the Southeast, as well as diverse aircraft’s found in the Wiregrass Area. It educated the public on the Enterprise Municipal Airport, honored our War Veterans, displayed aircraft’s from World War II though present day and entertained with aerobatics. We are always proud to partner with all the cities in our coverage area.